I began studying piano at the age of 5 and composing music for the piano at 11. My first few pieces were programatic in nature: “The Curved Dirt Road”, “The Trail”, “The Dark Gray Forest” and others. In high school I composed a piece in memoriam for a friend who died. During my early teens I began studies in music theory and piano performance at the Peabody Preparatory of music. Entering colllege I decided to take up the organ. Because of my preparatory studies I was ahead of the game and the entrance exam placed me in fourth year theory in my first year. Along with organ performance I also studied private theory and composition. Throughout the past fifty years I have composed hundreds of pieces for organ, choir, including works for solo voice, chamber ensembles, orchestra and MIDI (electronica). In the past five years I was able to premiere two of my large scale choral/orchestral works in Jackson, Wyoming; Septem Ultima Verba Iesu Christi In Cruce, and Et Lux In Tenebrae as director of the concert series of Our Lady of the Mountains Church. My works are available to the public at www.MyOpus.com. Currently I perform locally throughout the Jackson Wyoming locale as Teton Virtuoso. 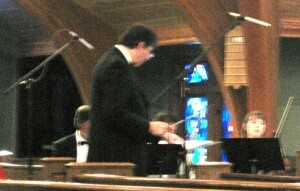 From 2008 through 2012 I performed for approximately 25 weddings per year at Our Lady of the Mountains Catholic church. Other venues include Trailside Gallery’s 50th Anniversary Fall Art Show, Jackson Hole Airport and private venues.